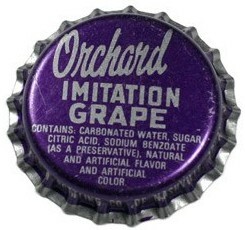 The Orchard brand imitation grape soda was a brand that was bottled by the Coca-Cola bottlers of Arkansas. It was a very small soda brand and may have existed independently before Coke bought the local brand to increase their sales in that particular area. This was, and still is, a very common practice of the larger soda manufacturers. Other than a few bottle caps circulating among collectors, there isn’t much evidence of this brand’s history that’s been left behind. Bottled by Coca-Cola Bottling Co.